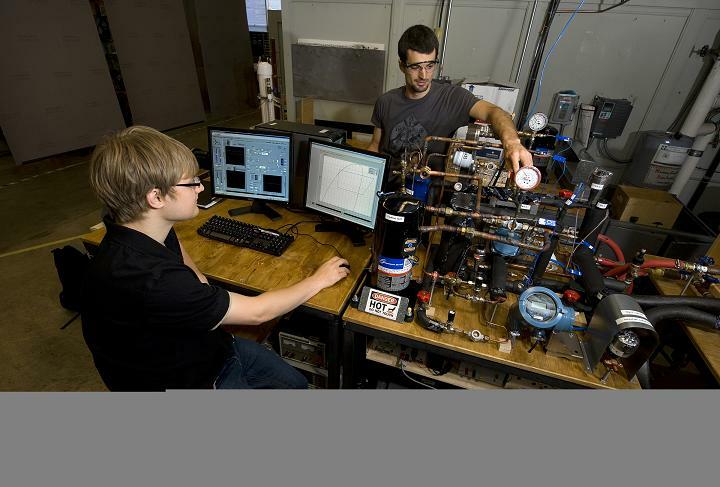 A new type of heat pump being developed at Purdue University could allow residents in cold climates to cut their heating bills in half. The research, funded by the U.S. Department of Energy, builds on previous work that began about five years ago at Purdue's Ray W. Herrick Laboratories, said James Braun, a professor of mechanical engineering. "With this technology we can maintain the efficiency of the heat pump even when it gets pretty cold outside," said Eckhard Groll, a professor of mechanical engineering who is working on the project with Braun and W. Travis Horton, an assistant professor of civil engineering. "We'll be able to extend the geographical range where heat pumps can apply," Horton said. "So this could open up a whole new market." Researchers expect to complete a prototype by the end of the three-year, $1.3 million project. The research, which also involves three doctoral students, is a partnership with Emerson Climate Technologies Inc. and Carrier Corp. Emerson will work with researchers to create the prototype heat pump, and Carrier will integrate the new heat pump into a complete system. The new technology works by modifying the conventional vapor-compression cycle behind standard air conditioning and refrigeration. "This could be a relatively simple modification to existing heat pumps, refrigeration and air conditioning systems," Braun said. The standard vapor-compression cycle has four stages: refrigerant is compressed as a vapor, condenses into a liquid, expands to a mixture of liquid and vapor, and then evaporates. The project will investigate two cooling approaches during the compression process. In one approach, relatively large amounts of oil are injected into the compressor to absorb heat generated throughout the compression stage. In the second approach, a mixture of liquid and vapor refrigerant from the expansion stage is injected at various points during compression to provide cooling. The added steps improve the compression process while also reducing energy losses due to friction in the expansion stage. "Cooling the compressor keeps the refrigerant dense, and that's important because it takes less energy to compress something that's more dense," Braun said. The researchers are developing a system for precisely controlling the flow of refrigerant from the evaporation stage into the compression stage using a series of small valves. A critical component of the new heat pump is a "scroll compressor," which uses a rotating, scroll-shaped mechanism to compress refrigerant. Domestic heat pumps normally use reciprocating compressors, in which a piston compresses refrigerant. "You can't inject a liquid into a reciprocating compressor, whereas you can with a scroll compressor, which is uniquely suited for this modification," Groll said. "Also, an important part of our project will be to determine the efficiency of a machine that pumps liquid while also compressing gas, so there will be a lot of computational modeling involved." The work grew out of research into the Ericsson cycle, an exotic refrigeration technology in which liquid is added to coolant as it is being compressed. The Ericson cycle, however, does not use the vapor-compression cycle because the gas never turns to liquid.